Cervinia itself (as in the resort centre) isn’t going to win any beauty contests. It just isn’t. In terms of its architecture and general charm, it can’t hold a candle to some of its neighbouring resorts. On the plus side, it’s all completely and utterly inconsequential. Doesn’t matter in the slightest. Because what Cervinia may lack in resort-centre charms it makes up for a thousand times over with absolutely spectacular skiing. Not to mention, the guarantee of a far longer and better season than almost anywhere else in the region. 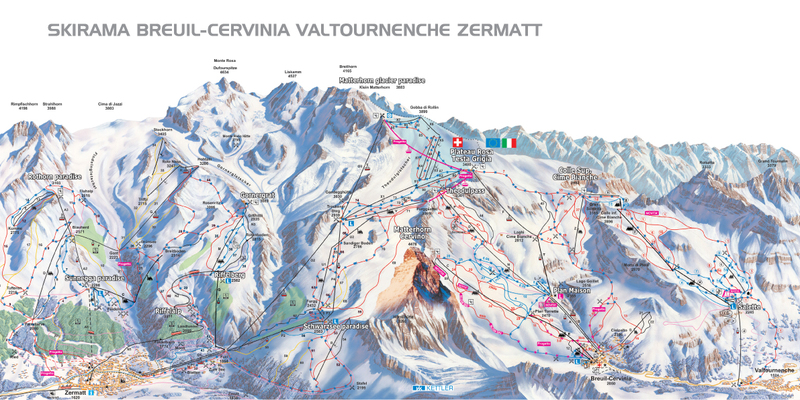 Cervinia lies in a high-altitude basin in the lap of Monte Cervino (the Matterhorn) and Piccolo Cervino (Klein Matterhorn), right in the heart of northwest Italy. But what’s interesting is that despite the rough, rugged and unforgiving nature of the landscape, the majority of the runs in and around Cervinia are laid back, relaxing and simply superb for intermediates. It has its most terrifying runs of course, but the smoothness of the skiing around Cervinia belies its backdrop. Given the high altitude of Cervinia, there’s often no better resort in Europe for skiing clear into the spring season. Brilliant conditions are guaranteed and the pistes here are looked after with such meticulous care and attention that even the peak of the season doesn’t leave them in a sorry state. And if you’re willing to board the odd tourist bus here and there, you’ll find a ton to explore in the surrounding region. There are no direct train connections to the resort itself. If you’re travelling by train, the nearest railway station is at Châtillon/Saint-Vincent (info and timetables www.trenitalia.it). Transfers are then available to the resort. All of the above will only ever result in our base-rate for ski transfers going down – we never over-inflate our prices at any time or for any reason. Unlike others, we consider as many factors as possible to lower our standard rates whenever possible. We always recommend booking in advance, in order to access the very best deals and discounts. We also offer substantial discounts for off-peak, off-season and midweek transfers to Alpe di Siusi. If looking for the best possible deals, travelling outside peak season or midweek typically results in the biggest savings. We offer midweek (Monday to Friday) prices with up to 60% discount than weekend prices. As previously mentioned, the majority of the action on offer at Cervinia is pure paradise for intermediate skiers. Nevertheless, there are plenty of broad and gentle runs on offer for newcomers, not to mention seriously challenging off-piste opportunities for the more daring! There are three simply superb ski schools based in Cervinia, making it a great choice for newcomers and families with younger children. Most of the classes take place in the nearby Cretaz area, which is easy to reach in a matter of minutes. Back in town, the general amenities and entertainment options may be a little on the basic side, but there’s still more than enough to entertain kids of all ages for the duration of your trip. It’s also wise to book quality resort transfers, in order to get your trip to Cervinia off to the best start. Comfort, punctuality and affordability – all the kinds of things that can make a real difference to your trip. With Alps 2 Alps, we guarantee the total package of superior value for money and service quality you can count on. If you want to secure the best possible deals on any of our services, booking in advance comes highly recommended. Nevertheless, Alps 2 Alps will always work hard to provide you with low-cost Cervinia resort transfers of the highest possible quality. Why wait until you arrive at Cervinia to start your holiday? Travel with Alps 2 Alps and the enjoyment starts the moment you get on-board!